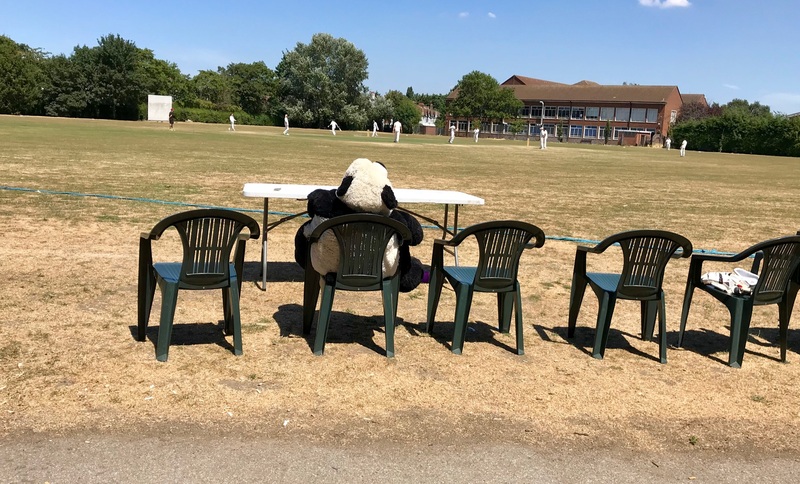 Another hot hot afternoon saw us return to Merton’s cute ground in south London. 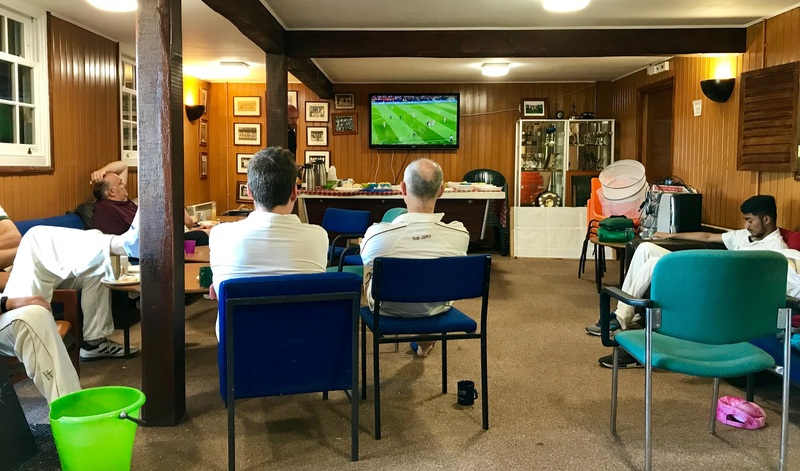 The World Cup final saw us start early to accommodate us watching the climax of the great tournament between innings. 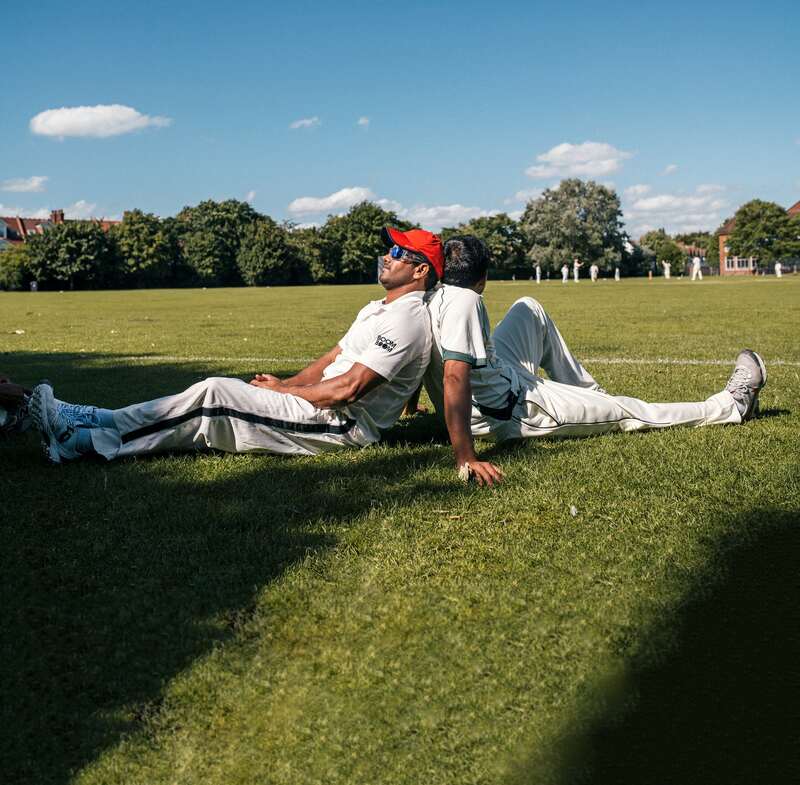 Availability was an issue this week and further late drop outs left us with well short of numbers Thankfully Merton are truly wondrous and helped us out with a fast bowler (South African Andrew) and sub fielders. 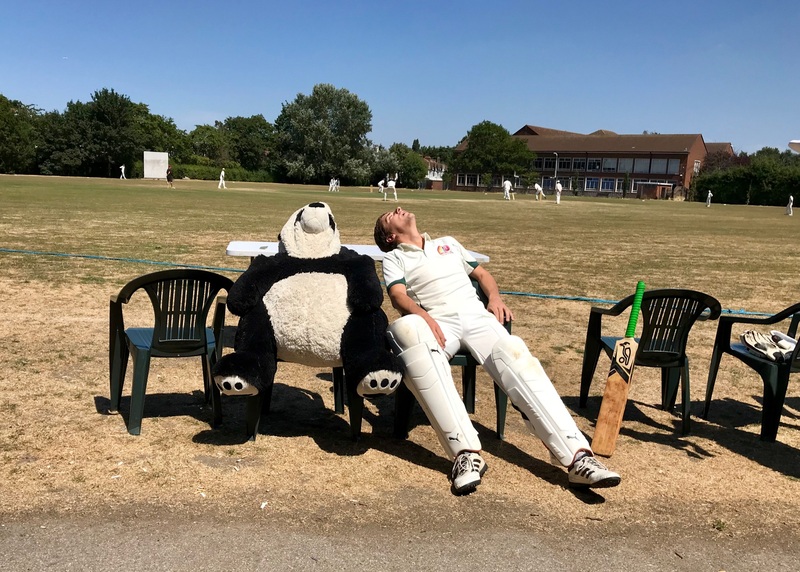 By agreement we batted first in the baking sun (thanks again to our hosts) If we didn’t last for the full 35 overs Merton were prepared to allow some batsmen to have a second innings – how helpful is that? Mahender and Scott opened for us with the skipper signalling his intent carrying on his aggression shown in last week’s match. A few balls to get the measure of the bone dry pitch and then some attacking shots. After 5 overs we were on 30. Merton , as ever a mix of youth and experience , opened with promising teenagers Sam Wyld (more of him later) and Romalo. The hundred came up in the 15th over with Mahender having reached his 50 off only 42 balls. 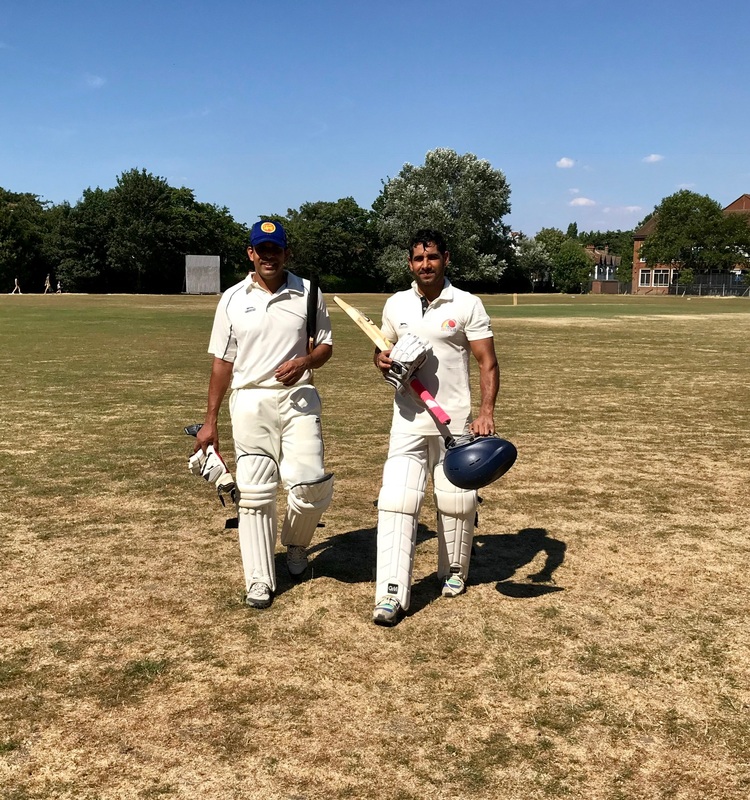 Scotty had by now got his eye in hitting boundaries and despite the bowling being mixed up the 150 came up in the 20th over – Scott had reached his fifty too before falling LBW for 61 off 61 balls including hard hit 10 fours. We were now 156 for one off only 21 overs. We’ll have to check the records to see when this was last surpassed by our opening batsmen. Stuart had a nice cameo for 7 , or was it 11! Before falling LBW. Dom in at 4 sportingly walked after edging to the keeper for 7. Our total was 212 for 3 off 28 overs and Merton must have thought they’d be able to put the brakes on. Newton had other ideas and hit a rapid fifty off only 23 balls! Merton’s heads never went down despite the onslaught on their bowling. Mahender brought up his second century of the season and showed no sign of tiredness as overs were despatched for over 10 runs. He ended up on 141 not out off only 91 deliveries. Our total was a formidable 293 for only 3 wickets – in the end Merton’s kind offer to allow batting again wasn’t needed. 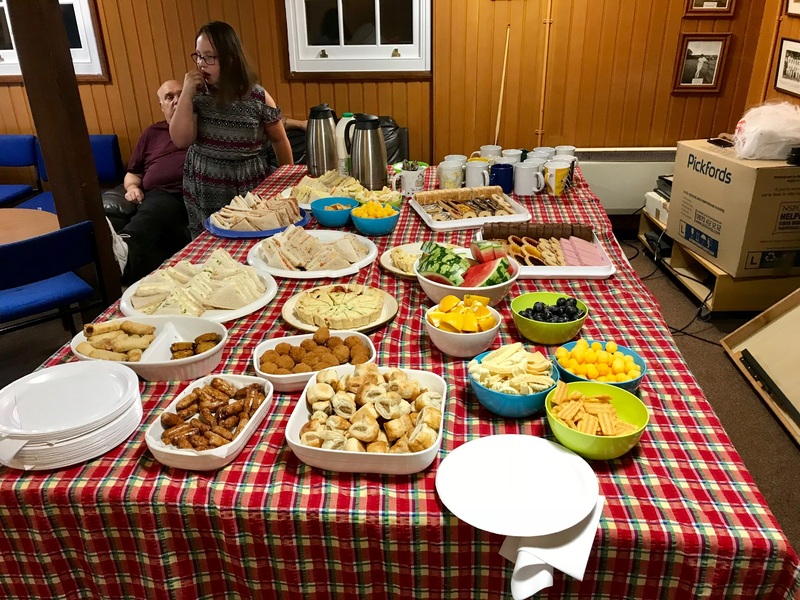 Both teams sat down to enjoy a sumptuous tea and watch Croatia run out of luck against France. After the 3rd French goal Merton’s openers padded up and their innings was away. Skipper Neil faced Newton and our pacy guest Andrew. Our ace supporter , Anthony , kindly helped out fielding on the boundary and young Sam Wyld and another young Sam helped out as sub fielders. Aggressive shots saw Meron reach 50 after 10 overs for the loss of Neil (a nice 31), bowled by Mahender. Jonners then caught a skier off Suggitt (the number 2) for 30 – Jonner’s first catch of the season! This second Mahender wicket soon became 3 when Mr Milton , in at 3 , was bowled. This brought Sajid in at 4 – he quickly showed himself to be a stylish bat taking on our bowlers , putting away anything loose. Sam Egan at 5 provided able support and the 100 came up in the 22nd over. It was Graces’ turn to chase the ball across the bone dry outfield. Mahender was able to use some more occasional bowlers out of necessity and our defendable score , Dom given 6 overs went for a reasonable 46 and Jonners had 2 overs for 12- and in a memorable moment dropped an absolute sitter caught and bowled! 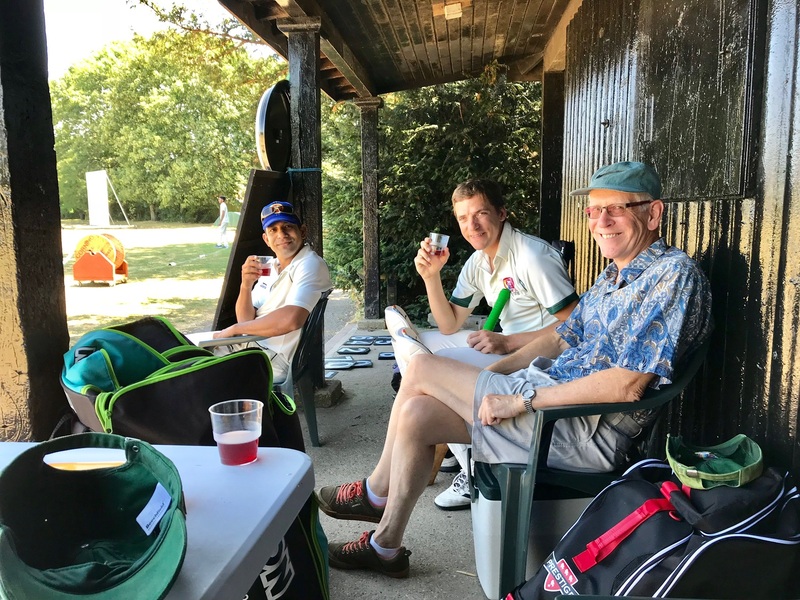 After 35 overs merton had reached 187 for 5 – although it was a win for us the game will be remembered for Merton’s skipper Neil proving to be unbelievably sporting and accommodating in coming to our aid in our hour of need – Sam Wyld fielded for 2 whole innings! Both teams then retired to the clubhouse for some much needed drinks! Unsurprisingly Mahender was our MOTM. So our winning run continues helped by some responsible batting and good fielding. How long will the hot spell continue? Next week sees us return to leafy Theydon Bois.